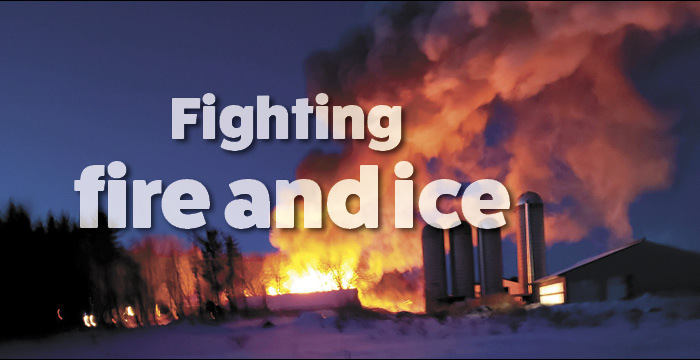 The fire departments of Sauk Centre, Long Prairie and Osakis responded to a calf barn fire Jan. 29 on the Long Bridge Dairy farm north of Sauk Centre on a night when the temperature was 30 degrees below zero. Dave Hinnenkamp, Jr. grew up on the farm and has worked on it since 2008. He and his father, Dave Hinnenkamp Sr., were out doing chores that evening. To thaw the water in the calf barn’s utility room, they brought a propane cylinder with a buddy heater. Normally, Dave Jr. would have been with his father in a different barn and might not have noticed the blaze as soon; due to the cold, though, he had stayed near the calf barn to split wood for his wood stove. Dave Jr. called the fire department around 5:30 p.m. before he and his father broke open the barn to let the calves escape. Out of the 23 calves that were in the barn, only one did not make it. After clearing out the animals, the next concern was the adjacent buildings; a granary and a shop were both close to the fire. The fire departments of Sauk Centre and Long Prairie, as well as a water tanker truck from Osakis, arrived 15-20 minutes after the call was made; by that time, the fast-moving fire was caving in the barn roof. In addition to fighting the fire, they also had to battle the cold. When the water valves on the Long Prairie truck froze up, the fire departments set up portable drop tanks to fill with water. The temperature also affected the firemen’s air supply. Dave Jr. also received help from family and friends who were in the area. “I don’t even know everybody that was here putting cattle away to be honest,” Dave Jr. said. The fire was finally put out around 8 p.m.; the barn was destroyed, but none of the adjacent buildings were affected. All the calves are being housed on the farm. Building insurance is still being worked through, and Dave Jr. hopes to build a new structure a little farther away from his other buildings. Dave Jr. is grateful to the all the people who helped him with the chores and with moving the calves to safety that night, as well as to the fire departments of the area that came out in such cold weather.